Sugar Bush says, "I can't wait to hear from my ePals and find out what they think of my new web site! I hope they like it as much as I do!" This is my big sister, Rio. Rio is a parrot known as a blue-crowned conure. She wants me to tell all of you to write in and tell us about yourselves. We promise to read every email. Thank you for visiting Sugar Bush Squirrel's Official Web Site. Please fill out the following form to request information about our products and services or to provide feedback about our site. Sugar Bush always welcomes comments from her friends and fans. Tell Sugar Bush "hello" or just request that we add you to her list of ePals. Try your luck at suggesting or guessing a pose for Sugar Bush. You never know what she's going to do next!!! When you are finished, click the 'Submit' button at the bottom to send Sugar Bush Squirrel & Kelly Foxton your message. You will see a confirmation below. 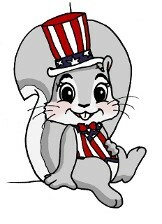 Sugar Bush Squirrel's cartoon character is owned exclusively by Ms. Kelly Foxton, President and CEO of Foxton Industries, Inc. and can only be used with Ms. Foxton's permission. The character is the exclusive and incomparable artistry of one of Germany's best up and coming cartoon artists of our era, Kapuschati. We searched the globe to find an artist who could capture Sugar Bush Squirrel's true personality and as you can see Kapuschati is among the best in the world. 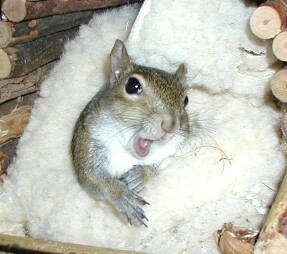 Sugar Bush Squirrel is HOT STUFF!! !